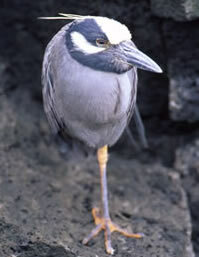 The yellow-crowned night heron is a short, stocky wading bird about 24 inches in length with a wingspan of a little under four feet. It has long yellow to orange legs, red eyes, a black bill, and a short neck. It has a slate gray body, a black head with a white streak on the side of its face and a yellowish-white crown. In breeding season it has a yellow plume of feathers on its head. Males and females look alike. 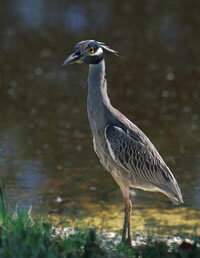 Immature yellow-crowned night herons are a mottled grayish-brown. 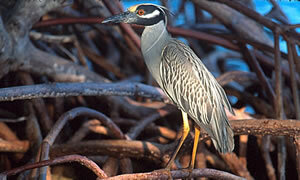 The yellow-crowned night heron breeds from southern New England south to Florida and west to Texas. It also breeds along the Mississippi River. It winters on the Gulf and Atlantic Coasts. 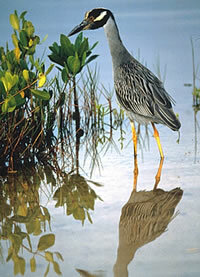 The yellow-crowned night heron lives in wooded swamps, fresh and saltwater marshes and thickets. The female lays three to five eggs on a nest of sticks placed in a tree or sometimes on the ground. Both the male and female build the nest and incubate the eggs. The eggs hatch in about three weeks. Both parents care for the chicks and feed them regurgitated food. The chicks fledge when they are about 25 days old.